The BIT 802E Card converts a standard BOP into a bipolar ethernet controlled power supply. Allows ethernet control of 100W, 200W and 400W BOP bipolar power supplies via LAN/Web page. Labview and C drivers provided to speed up test system integration. Web page operation for monitoring and quick verification of complex test programs. True 4-quadrant programmable voltage and current power supplies. 14 Standard Models, ± 0-5 Volts to ± 0-200 Volts, ± 0-5 Amps to ± 0-30 Amps. Dual-range 16-bit interface provides 15 bits of resolution for both full and quarter scale of output. Inductive load and capacitive load optimized versions. The BIT 802E Card converts a standard BOP into a bipolar ethernet-controlled power supply. Allows ethernet control of 100W, 200W and 400W BOP bipolar power supplies via LAN/Web page. Labview and C drivers provided to speed up test system integration. Web page operation for monitoring and quick verification of complex test programs. Setup using a web page. Power supply control via web pages and socket interfaces. Arbitrary waveform generator supporting multiple dwell times from web page or driver calls. Labview G and C drivers. The KLR Power Supply Series are automatic crossover, 1U high, 2400-watt voltage/current stabilizers with a full rectangular output characteristic 20-300V, up to 300A. For each model a multitude of limit models can be configured, allowing the unit to be configured to maximum settings below the rated voltage and/or rated current. When a limit model is established the unit will not accept programming values above the user-defined limits. The standard KLR Models (no suffix) have built-in GPIB and RS 232 interfaces. 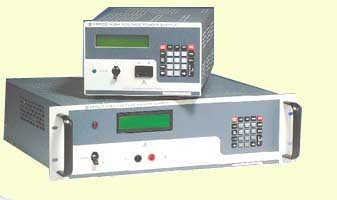 The E-Series models (suffix E) have built-in GPIB and LAN interfaces. The LAN interface is an ethernet-based interface that allows multiple-user access via a standard web browser. The Rapid Output Discharge Circuit (RODC) option (suffix R) is available on all KLR models. This circuit rapidly discharges the output capacitance, thus significantly reducing response time to reductions in output voltage. The Kepco Series KLN is a new family of automatic crossover, low-profile, high-performance, low-cost programmable power supplies. 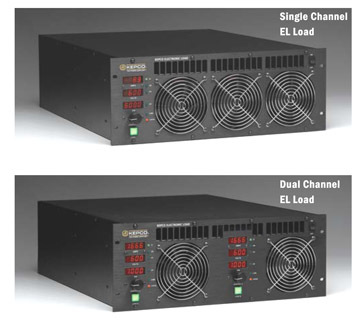 The KLN Series offers stable d-c power in a 1U high, half-rack package for 750W, a 1U high, full-rack package for 1500W and a 2U high, full-rack package for 3000W. A speed-controlled fan limits acoustic noise for bench top applications. Programming of voltage, current and voltage and current limits may be achieved by analog means or by RS 485 digital control. GPIB or LAN interfaces are factory-installed options. The BOP-1KW-GL series are standard BOP 1KW models that are optimized for exceptionally low current ripple and noise and improved stability (drift and temperature), making them ideal for driving inductive loads such as large magnets or motors. These bipolar power supplies pass smoothly through zero without switching to provide true ± voltage and ± current. L suffix models operate in a stable manner in Current or Current Limit Mode for loads up to 1 Henry (typical applications: motor testing, testing of magnetic components cryogenic applications and powering correcting magnets for medical imaging applications or particle accelerators). C suffix models operate in a stable manner in Voltage or Voltage Limit mode for capacitive loads up to 10 millifarads (typical applications: solar cell/solar panel testing, testing of piezoelectric driving devices, capacitor testing, driving and testing of capacitive transducers. The EL Series is a line of modular aircooled, DC electronic loads used to test power sources such as batteries, power supplies, generators, chargers, fuel cells, etc. Power ratings start at 1KW; standard models have maximum test capabilities of 50, 200, 400 and 600 volts. High current and power operation are achieved via parallel connection in a master/slave configuration. Individual modules are capable of up to 5KW and 600 amperes. Kepco's 1KW BOP now includes 6V/125A and 25V/40A models. The BOP Hi Power Series are true 4-quadrant programmable voltage and current power supplies capable of both sourcing and sinking power. 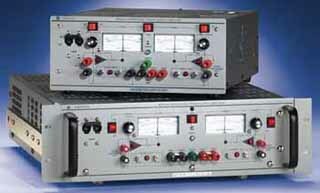 These bipolar power supplies pass smoothly through zero to provide true ± voltage and ± current. 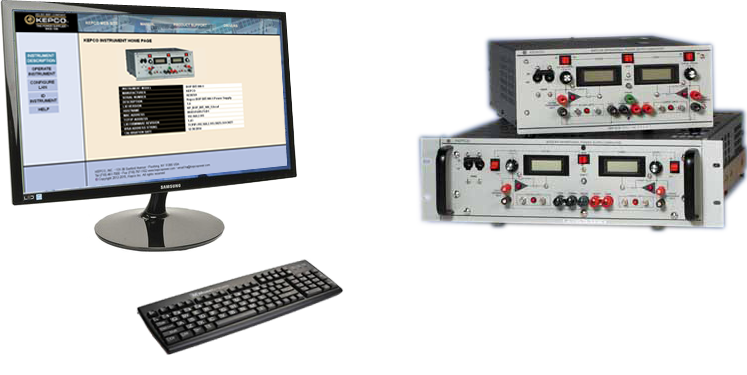 Kepco's revolutionary KLP Series is a 19-inch x 1U laboratory grade switch-mode power supply with built-in digital and external analog programming interfaces. Standard models include built-in GPIB and RS 232 interfaces; E-Series models have built-in GPIB and LAN interfaces. The LAN interface is an LXI-approved ethernet-based interface that allows multiple-user access via a standard web browser. Seven models can provide full 1200W output power from 0-10V through 0-600V and all voltage/current combinations in between. Option R (for all models) rapidly discharges the output capacitance, thus significantly reducing response time to reductions in output voltage. Kepco's 3U 50W, 100W and 150W HSF-PFC models now join the 350, 600 and 1500W models which all include PFC at no additional cost. 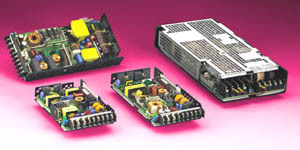 HSF plug-in power supplies are designed for hot swap applications. They feature a built-in forced current-share circuit and OR-ing diodes that allows them to be configured for N+1 redundancy. They are available in 50, 100, 150, 350, 600 and 1500 Watt sizes, outputs from 3.3 to 48 Volts. Kepco's -1UR HSF models also include PFC at no extra cost. The 1U high rack adapter will mount four of the HSF 50W-1UR, HSF 100W-1UR or HSF 150W-1UR or power supplies. Each plug-in power supply is equipped with a power on/off switch, indicator LEDs and voltage test points. Kepco has added five 600W HSF models (12V, 15V, 24V, 28V and 48V) to complement the 1200W (24V) and 1500W (48V) models recently added to the HSF Hot Swap Plug-in Series. 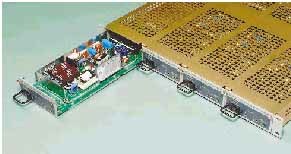 Up to four 600, 1200 or 1500 watt modules may be mounted in a 3U Kepco RA 19-4C rack adapter. These models are also available with an optional front panel meter. The new RA 19-4C rack adapter accommodates the 600W, 1200W and 1500W units for mix and match capability. Kepco has added a 150W Model to RTW Series. Kepco's RTW 50- 100- 150- and 300-Watt Series are RoHS (Reduction of Hazardous Substances) compliant, single-output, full featured power supplies . All power groups are less than 1U high and have small footprints. Full power operation is guaranteed to 50 degrees Celsius ambient with no forced air cooling required, making the RTW ideal for applications in harsh environments. 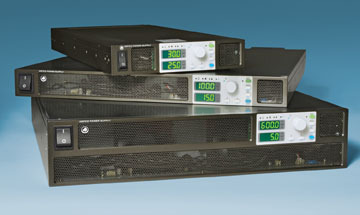 Kepco has added a 40 Watt half-rack design with 100% current sinking capability to the 200 Watt full-rack BHK-MG Series. Both sizes provide outputs ranging from 0-300 Volts to 0-2000 Volts, featuring both digital and analog programming. The Kepco RKE SERIES offers active PFC, RoHS (Reduction of Hazardous Substances) compliance, FCC/VDE Class B compliance, wide output adjustment range, N + 1 redundant operation, remote on/off, and a 5 year warranty in two models: 48 Volts (1500 Watts) and 24/28 Volts (1200 Watts). Their low cost makes them suitable as a bulk power supply for distributed power applications and a rectangular current limit feature also makes them ideal for battery charging applications. This driver supports digital calibration (no manual pots) and multiple control and read back ranges which are incorporated in the BIT 4886 Interface Card.